Professor János Surányi has been active in the organisation of mathematics competitions, in mathematics education and the popularisation of mathematics for many years. He restarted the world famous Kozepiskolai Matematikai Lapok (Kömal), and has been actively involved with the Kürschák (formerly the Eotvos Competition. He has been a member of ICMI and other international commissions. His research interests include mathematical logic, number theory and combinatorics. 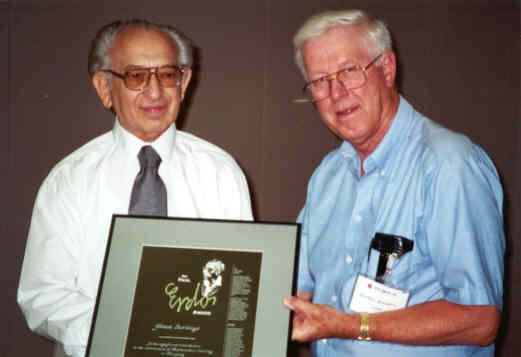 Professor Surányi receiving his award from Professor Ron Dunkley, President of WFNMC, in Tokyo on Friday 4 August, 2000. People often find it chic not to like mathematics, even to understand nearly nothing of it. Mathematicians are sometimes characterised as impractical, awkward persons. Quiz-games organised repeatedly by Hungarian television during the 60s on different subjects, including mathematics, proved surprisingly useful in reducing this general repugnance to mathematics. People who hardly understood the questions, let alone the solutions, watched the contesting pairs of students with great excitement. Seeing that normal, lively children, far from the `dry-as-dust' type have found the solution in 2 or 3 minutes, these people have lost their proudness for being ignorant of mathematics . Unfortunately, these quiz-games have been discontinued from that period. Mathematical competitions, organised yearly partly for raising interest in mathematics and partly for the identification of mathematically gifted young people, date back somewhat more than 100 years  . According to Freudenthal's report, the first one amongst such contests was the Hungarian Eotvos, later the Kürschák, Competition, first held in 1894 and becoming widely known outside Hungary as well. The collection of problems of these competitions appeared from time to time in foreign languages as well, with solutions and comments, which partly shed some light on the background of some of the problems and partly expounded some fields of mathematics in connection with particular problems . Contests improve the capacity to solve problems, and whoever recognises the pleasure of it and discovers its beauty will enjoy it forever. A great discovery solves a great problem but there is a grain of discovery in the solution of any problem. Your problem may be modest: but if it challenges your curiosity and brings into play your inventive faculties, and you solve it by your own means, you may experience the tension and enjoy the triumph of discovery. Such experiences at a susceptible age may create a taste for mental work and leave their imprint on mind and character for a lifetime. Problem solving as described on Pólya's book creates an attitude which is not easily lost and is helpful in many situations other than mathematical ones. However, not all gifted children are good at competitions and in particular, not all of them can be winners. Good contest results also depend on having good nerves, quick reaction time and other psychological components as well as talent, and failure can discourage participants, not only from competitions, but from mathematics itself. 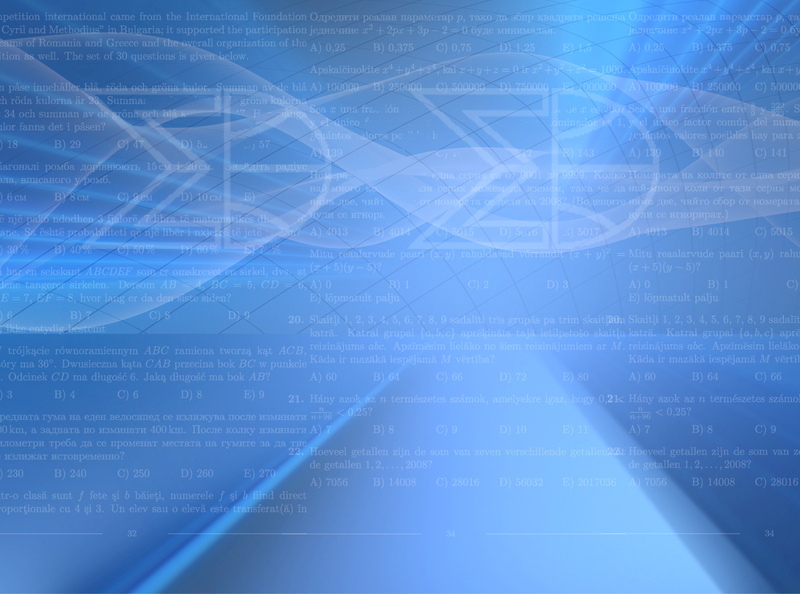 Problem solving is an essential component of mathematicization but certainly not the only one. Moreover, emphasis is given to some topics appropriate for good contest problems and for some types of problems, whereas some other fields do not fit into competitions. These are, however, only warnings which must be heeded and taken into consideration in order for competitions to play their beneficial role. In the case of two-round competitions, the problem of discouragement can be lessened essentially by giving more, say 8, problems in the first round, amongst them sufficiently easy ones but also others which are hard enough to select the participants for the second round. It is not necessary to solve all the problems, the participants should be able to choose to some extent according to their interests. An overgrowth of competitions - and we see these symptoms in Hungary - and generally on an overdosing of talented youngsters with mathematics can turn them against their first interest and the danger of this occurring can not be neglected. The emerging different difficulties require skills and effort from the teacher. Without going into details, I will illustrate this by an example and a counterexample in that traditional teaching methods must be changed as well . By traditional teaching, the teacher gives the definition and supports it with some examples, require the pupils to repeat the process and thus believe the students have grasped the concept. Let us take the natural numbers as a result of counting. Children use these seemingly well, add and subtract in the range of natural numbers. However, an experiment shows that the situation is not completely encouraging. I must admit that I was skeptical initially whether the experiment would provide any difficulty at all to the students. Five match boxes were laid out on a table and before each one was placed a coin. This was shown to 7-8 year old children, one at a time, and the question was asked: ` Were there more boxes or coins?'. Naturally the answer was: `the same.' Afterwards, the boxes were drawn further apart in front of the children while the coins were left unmoved. A large proportion of the children then said that there were more boxes than coins. Some even tried to guess how many more. Similarly, children often believe that the space objects occupy influences the number of them. An example in the other direction shows how children develop real notions. A group of first form pupils have discovered negative numbers while practising addition and subtraction climbing and descending stairs. They numbered each step as the stairs led to the cellar, they called the new numbers cellar numbers and denoted them by c_1, c_2, and so on. They have had this notation for some time. They operated with addition and subtraction in this domain quite some time before it was prescribed in the syllabus. When the conventional notation was introduced, this reminded them of the subtraction sign where the `cellar numbers' had come from. Test type competitions have become a world wide movement nowadays, which to my mind, is a completely abortive process. The short time available for the solution of a problem does not allow for what the major aim and benefit of these competitions should be, namely creative thinking. Instead, it reduces the competition to a game of trial and error. Maybe this type of competition is inevitable where there are hundreds of thousands of competitors, but this is not the case in a small country such as Hungary with only ten million inhabitants. Nowadays, more and more disciplines demand different domains and aspects of mathematics and this has the danger that the use of mathematics can be reduced to the formal introduction of specific procedures. It would be far preferable instead to have students trained to intelligently read mathematical texts which would enable them to later acquire knowledge not yet taught. For more details see . Mathematical competition problems can also supply the demands of teachers for the provision of various problems and types of problems, generally supplementing the teachers' own collections. Competitions must be and are generally independent of the teaching practice in the sense that their results should not influence students' marks obtained at school. This is, however, not the case in the assessment of the efficiency of the work of the teacher by some headmasters and sometimes even by the teacher himself. Moreover, having the students sit for mathematics competitions cannot replace the work of the teacher and the demands on him in the classroom: a low level of mathematics teaching seldom produces good mathematicians and good competitors. In the case of the sufficiently well prepared teachers there is the additional danger that it is not difficult at all and can even be more comfortable for them to train only their best students and not pay much attention to the rest. The opposite can occur as well: the teacher does not inform his pupils about competitions and student journals in mathematics (described below) as students can then raise difficult problems which lead to much effort and trouble for the teacher in answering these. I mention several problems which teachers have to solve and to overcome in their everyday work: preparation for the lessons taking into account considerations for the difficulties the students may have understanding; corrections of their papers and so on. All this assumes a thorough grounding and much attention from the teacher. This demands much appreciation of the social as well as educational aspects, a characteristic often lacking. Significant tools for out of school mathematical education are journals of mathematics for students - if and where they exist. They arouse interest in mathematics quite considerably. In Hungary, the first journal of this type has been published regularly (10 issues a year) since 1895 with some breaks occurring in the two world wars. This journal played an essential part in my becoming a mathematician. This partly explains also why after the Second World War I was for quite a long time the editor of the journal. I have referred repeatedly to the different tasks and difficulties encountered by teachers. To supplement their work, periodicals for mathematics teachers are also published. These contain, in addition to articles from experts and teachers on different mathematical and didactic questions, problems to solve. Solutions by students are not accepted in this context. Mathematical competitions are also organised in Hungary for university students. They have 10 days to work at home on usually 10 problems from very different branches of mathematics  . Not even the suspicion of consultation with others, either colleagues or experts, has been in evidence since 1950. Here, however, secondary school students are allowed to participate and from time to time some of them receive prizes. Hajós G, Neukomn G., Surányi J., (1955), Matematikai Versenyttelek. Vol I, Tankonyvkiad\'o, Budapest, Vol II (1929-1963), Vol III Surányi J., (1964-87), Vol IV, Surányi J., (1988-97), TypoTEX, Budapest (1998), Translated into English as Hungarian Problem Books I and II, also in Japanese, Romanian and Russian. Székely G. (Ed), (1996), Contests in Higher Mathematics - Miklós Schweitzer Competition 1962-1991, Springer Verlag, New York.